Do you know what the common causes of commercial fires are? According to the National Fire Protection Association, there is an estimated average of 69,310 commercial fires every year. These fires occur across industrial and manufacturing facilities, stores and mercantile, and high-rise buildings. These fires cause countless deaths, damages, and injuries. But what are some common causes of commercial fires? Read on to find out. Electrical systems and appliances seem to be one of the most common causes of commercial fires. Many of these businesses are lost when they hire individuals who are not qualified to do their electrical work. Not only will these modifications cause code violations, they could also put your business and personnel in danger. Overloading and misusing your electronics and electrical circuits can also lead to an electrical fire in your commercial facility. Although we do not typically think about the systems in our commercial facilities, boilers, water heaters, and furnaces all share some of the blame for commercial fires. Since these appliances are usually kept out of sight, it can be hard to know when they are not properly installed or maintained until something goes wrong. It is important to ensure your systems are installed properly by a licensed professional and they are also regularly installed. Make sure the area around these systems are clear of debris and clutter to avoid adding fuel to the fire. Human error and arson are also two very common causes of commercial fires. Some human errors also include forgotten coffee pots, smoldering cigarettes, and spilled liquids on electrical equipment. These accidents can mean loss of property and injuries or deaths to your employees. For accidents like these, it is important to keep a fire extinguisher on hand so you will be able to stop the fire from spreading. Arson is also a very common cause. Arson is defined by someone intentionally setting fire to your commercial space. Many arson attempts are acts of vandalism or revenge by unhappy clients and workers. 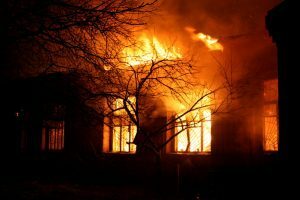 If your business is the victim of arson, make sure to cooperate with the authorities in order to figure out the cause. These are some of the most common causes of commercial fires. Luckily, Anderson Fire Protection, Inc. is here to help you protect your business. For more information on our fire protection systems, call us today! Common Causes of Commercial Fires with Anderson Fire Protection Inc.